Your Wine Made On Our Premises. Ferment-on-Premise is a concept that evolved from home winemaking. People have been making wine in their homes for centuries however it can be hit and miss depending on the ingredients used and how vigilant the winemaker is. Winemaking also entails an investment of equipment, time and labour plus you need space to work in. Ferment-on-Premise offers an attractive alternative. You purchase the ingredients and for an extra fee we provide a service to make your wine. This includes the use of our facility and equipment plus our winemaking expertise. Your wine is kept on our premises where we take all the steps required to complete the fermentation and get it ready for bottling. 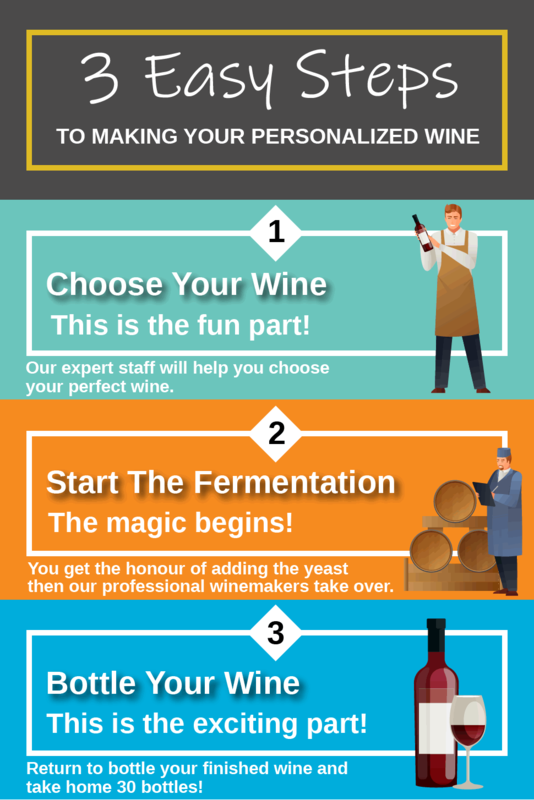 To start the process you visit our store and choose your style of wine. Once you've made your decision we'll immediately start crafting your wine. Your ingredients are prepared for fermentation under your watchful eye and you get the honour of starting the fermentation by adding the yeast. Let the magic begin! This takes about 10 minutes of your time. Your inoculated grape juice is then sent to our fermentation cellar where our professional winemakers will take over. Depending on the style you've chosen, your wine is ready in four to eight weeks. Then you return to our store and bottle your wine using our commercial bottling equipment. This takes about 30 minutes of your time. For a total investment of less than 60 minutes of your time you get 30 bottles of your own personalized wine for about one-third the price of liquor store equivalents. Can I purchase wine by the bottle? We are not licensed to sell wine. We sell ingredient packages which makes approximately 23 litres (30 bottles) of wine and offer a service to ferment it on our premises. When the wine is finished you have to return to bottle it and take it home. Do you supply the bottles? We encourage you to use your own bottles however we also sell new bottles. If you bring your own bottles they must be physically clean with no dried-on residue and any commercial labels will need to be removed. We will run your bottles through our commercial bottle washer to further clean and sanitize them. Can my wine be bagged? We have a commercial filler that makes filling bags fast and easy. Bag-in-box wine is very popular. It requires less time and space and it's awesome to have wine-on-tap for any occasion. Once your wine is bottled it can be drank at any time however most wines will taste better if you store it away for a while. Some wines are meant to be drank with little or no aging while some will keep improving for years. Our expert staff will help you choose your wine depending on your needs and expectations. Will my wine taste as good as the wine I buy from the liquor store? Many of our customers say their wine tastes better! Our juice is supplied by the two biggest names in the craft wine industry who are owned by commercial wineries. It's the same juice they use in their low to mid-range priced commercial wines. If you normally purchase wines in the $10 - $30 range you'll be more than happy with the wine you'll make.